Troy Owen never thought he’d see the day when the cyber thieves who robbed his company of $800,000 would ever be charged with any crime. Owen said investigators had warned him early on that the perpetrators were mostly overseas in places like Ukraine and Moldova, and that it might be tough to pursue those responsible. But earlier today, authorities in New York announced they had charged more than 60 individuals — and arrested 20 — in connection with international cyber heists perpetrated against dozens of companies in the United States, including Owen’s. In November 2009, cyber crooks used a sophisticated password stealing Trojan horse program called “ZeuS” to hack into computers at Owen’s firm — Plano, Texas-based Hillary Machinery. The program swiped the company’s online banking passwords, allowing the attackers to initiate more than $800,000 in bogus transfers out of the company’s online account to dozens of people in the United States who helped launder the money and send it to the attackers in Eastern Europe. Fraudulent wire transfers from Hillary Machinery. 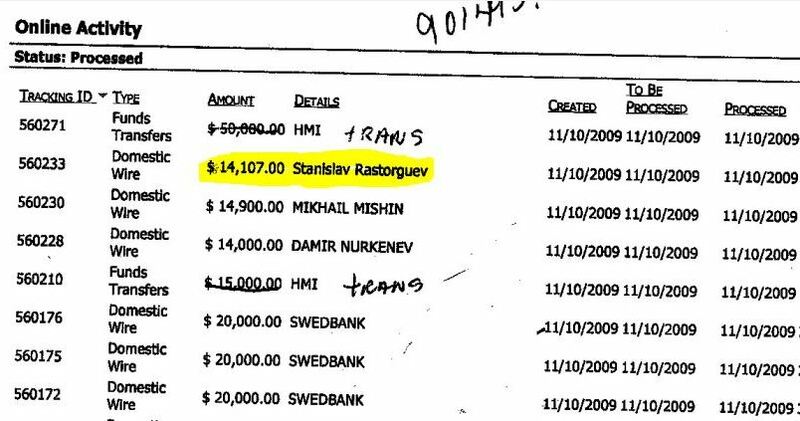 More than $14,100 of Hillary’s money was wired to Stanislav Rastorgeuv, a 22-year-old Russian national who entered the United States in June 2009 on a “J1” student visa. According to charging documents, Rastorgeuv was the poster child for money launderers looking to recruit new mules to help retrieve the proceeds of ZeuS Trojan virus attacks. Authorities say almost all of those arrested or charged in this case are young Eastern Europe men and women who were either planning to travel to, or were already present in, the United States on J1 student visas. Once the students were in the United States, the organizers of the mule organization gave the recruits fake foreign passports to open accounts at local banks. Then, days or weeks after those accounts were opened, other actors in the group would transfer money from cybercrime victims into the mule accounts, typically in amounts close to $10,000. Once the transfers were complete, the mules would quickly withdraw the money, keep a portion for themselves (usually 8 to 10 percent) and transfer the remaining amount to other participants in the fraud scheme, usually individuals overseas. Some mules were asked to open a large number of bank accounts to help launder stolen funds. 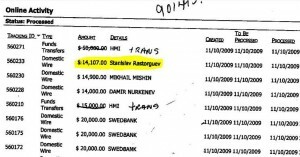 Charging documents say Rastogeuv opened up multiple bank accounts under his own name and using fake passports for fictitious individuals, including the names “Petr Rubsashkin” and “Alexey Iankov.” In addition to the unauthorized transfer sent to him by Hillary Machinery, Rastogeuv allegedly helped to launder nearly $30,000 from other victim companies over the next two months. U.S. authorities say the ringleader of the New York-based money mule gang was Artem “Artur” Tsygankov, a Russian citizen living in New York who allegedly recruited Rastogeuv and other mules, supplied them with fake identity documents, and managed their daily activities. In all, the New York gang cleared more than $3 million from victim corporations using hundreds of accounts opened under false identities. Others are charged with hacking into and siphoning funds from online brokerage accounts. Jamal Beyrouti, 53, Lorenzo Babbo, 20, and 29-year-old Vincenzo Vitello worked with hackers who infiltrated trading accounts at E-Trade and TD Ameritrade, executing fraudulent sales of securities and transferring the proceeds to accounts the mules controlled. At the same time, the attackers blasted victims’ phones with a barrage of calls to prevent the brokerage firms from contacting them to confirm the legitimacy of the transactions. The scam allowed mules to transfer roughly $1.2 million from hacked brokerage accounts.